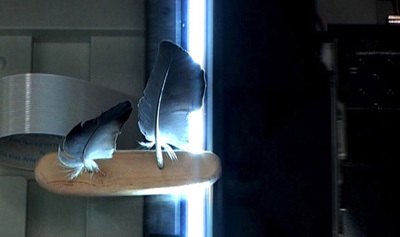 The BY TWO FEATHERS video provides a visual version confronting the text-based animation SUPPORT TO FLY. The visual approach completes the projects exploration and translation of the original dream material. The video can be understood as a cinematographic attempt of translating the memory of the particular dream into an audio-visual perceivable artefact.The hero as a dreamer experiences a story relating to the process of finishing his work. The last two missing feathers of his sculpture receive the indicative meaning by the narrative and on the other hand they define aspects of the symbolic content of the sculpture itself.